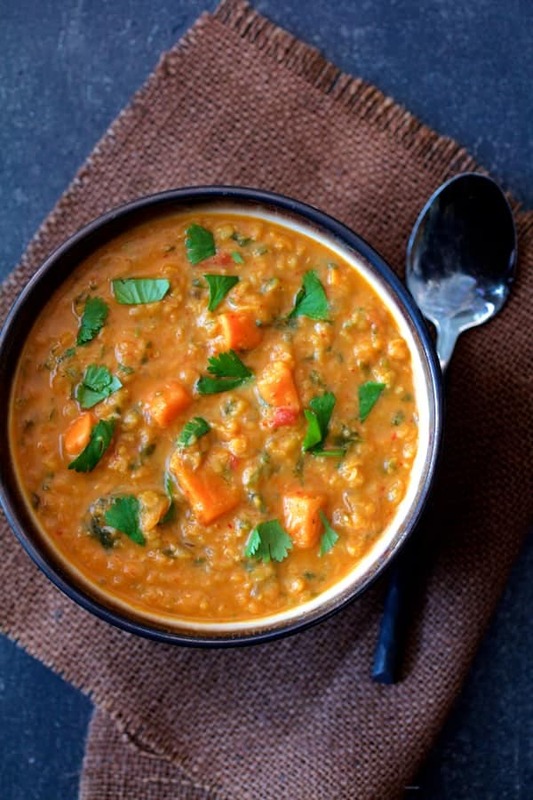 Thai Red Curry Sweet Potato and Lentil Soup delivers delicious Thai-inspired comfort and warmth in a hurry! Hope you all had a good first week of 2016! After being off for the holidays, I couldn’t seem to get back into my cooking groove. In the personal chef business, you have to learn to juggle and think about five things at once. For example, while one dish is cooling, you’re baking off something else, something’s going in the pressure cooker, other items are cooking on the stovetop, you’re washing used equipment and you’re prepping and planning how your next steps will be executed. Some days it flows, and some days not so much…. But hot diggity, I turned out some great food this week for my clients! You know it as well as I do–after a full day, dinner needs to have minimal steps. 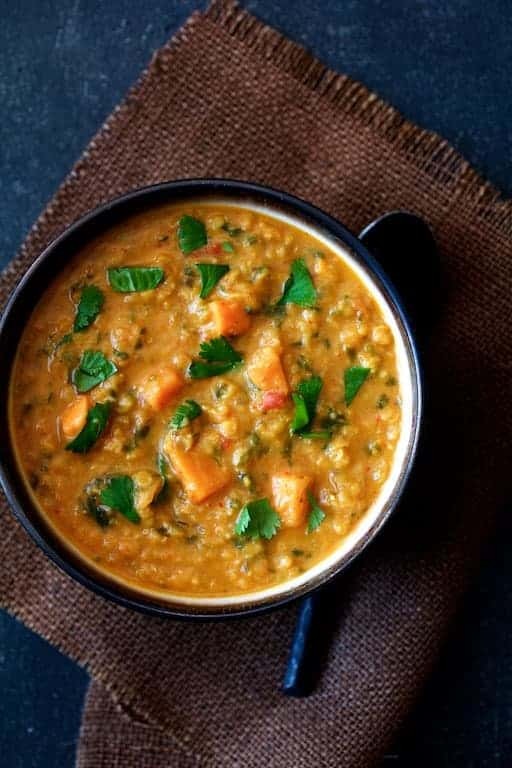 My Thai Red Curry Sweet Potato and Lentil Soup is perfect when you’ve had a long day and need some comfort and warmth in a hurry. This soup has complex Thai-inspired flavor but comes together quickly with red curry paste. I no longer bother making my own red curry paste after discovering the Maesri line of curry pastes at a local international market. (Not an affiliate link or sponsored post, I simply love the product.) These pastes have plenty of punch, are made from real ingredients and flavorwise, beat grocery store brands hands down. 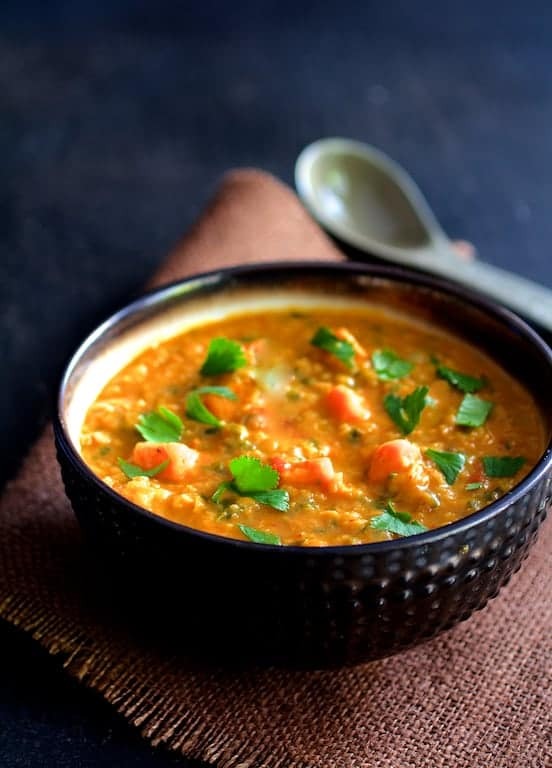 Red lentils cook much faster than brown or green and at about the same rate as the sweet potatoes. Gonna say it again–it’s a good idea to look lentils over for stones, sticks and odd-looking bits. Keeps teeth intact! This soup freezes great so make a double batch and freeze in small portions for delicious Thai comfort all winter long! Used red curry sauce since store did not have the paste. Added greenpepper along with the onion. Forgot to buy the sweet potato so did not add that. Pureed the lentils after they cooked in the crookpot. Added some garam masala. Then ate it over a mixture of saffron rice, quinoa and brown rice made with homemade chicken bone broth. We loved it and will make again. Hi, Kathy! Sounds delish but sounds like a whole new dish you created from this inspiration! Love it and I’m all for it! Thanks again and so glad you enjoyed! I don’t have any curry paste but do have powder. Could I sub the powder for the paste and in what quantities? Hi, LaDena, If it’s Thai red curry powder, you most likely could. However, if it’s Indian curry powder you will have an Indian-inspired soup rather than Thai. Thai red curry paste and Indian curry powder are two very different things. I like the paste because the taste is so much fresher. Thanks so much and hope it works for you! ok Carol. I just completed my marathon soup session. You win!!! I made beef barley, chicken barley, moroccan red lentil and your thai red curry sweet potato lentil. Oh My. The reviewers here are really telling the truth. I love this!! I only added 2 Tablespoons but might go for the full 3 Tablespoons next time. Thank you. Hi, Anne, Oh my, how you made my Monday! Thanks so much! Making soup is just the best thing ever and I love that you made a marathon out it! Thanks Carol for your speedy reply on freezing the soup. I am having a marathon soup session right now because I have contractors here and I can’t leave! Chicken Barley, beef barley, moroccan lentil and now your thai red curry. My freezer will be packed! Hi, Anne, Thanks so much for your question. You absolutely can freeze this soup; it does very well. Whenever your freeze something, be sure to cool it down all the way before placing the lid on putting it in the freezer. Condensation is what causes those ice crystals and can cause freezer burn. Thanks again and hope you enjoy! I made this for supper tonight and it was a big hit 🙂 My meat loving husband even had seconds! My only “issue” was that the coconut milk curdled … because of the acidity of the tomatoes I guess? I will still make it again, it just looked a little “off”. Very yummy! Hi, Mylene, Thanks so much and so glad you all enjoyed! Honestly, I had never heard of coconut milk “curdling.” Did not know something that was not dairy could do that so I did a little research. Yes, the heat could do that. Evidently, if you just keep stirring, that should break up. If that happens, it will not affect the flavor but yes, will look a little funky. Thanks again and thanks for letting me know what happened! Learn something new every day! Hi, Olivia, Thanks so much and glad you enjoyed! Now that it’s cooling off here, I will be making this soup again myself! It’s one of my favorites, too. Love that you added your own special touches to make it your own. Thanks again and please stay in touch! Wow what a great soup!! It is winter here in New Zealand at the moment and we have just devoured you fantastic creation. This will be a family favourite . Hi, Mark, Thank you so much! So glad you enjoyed and happy to hear from New Zealand! Take care and stay warm! This has to be one of the best soups I’ve ever made! I had already chopped and added fresh ginger before I realized the recipe didn’t call for any. It was a good addition. I also added a good size scoop of peanut butter the first time I made it. It is good with that addition as well. I let my daughter taste it, and she went home and made a pot for her family that night. Thank you so much for sharing this marvelous recipe. Thanks, Tami! So glad your whole family is enjoying! I didn’t include ginger in the recipe because most red curry pastes already have it. However, if you like it with more, by all means, go for it! I also love that you made this soup your own with the addition of the peanut butter; it sounds perfect! Thanks again and please stay in touch! Thanks, Alexandra! It’s definitely a matter of personal taste, but glad you enjoyed overall! My husband and I love this soup so much I’ve made it twice recently. It will now be on my rotating roster as a favorite. I do mash the soup to make it less chunky just before serving and use only the full fat coconut milk, not light. Thanks so much, Jennifer! Glad you are enjoying! How many people does this soup serve? Looks amazing! Hi, Rayleigh, Thanks for your question. I just changed my recipe format and in the conversion, some information must have been lost in cyberspace. I’ll be going through and adding what’s missing so I appreciate your letting me know on this one. Anyway, it serves 4 to 6 people. Thanks again and hope you enjoy! This is my new favourite soup! It’s a hearty texture and FULL of flavour, soooo good!! Thanks for sharing this recipe. Thanks, Lara! So glad you are enjoying! You made my day and please stay in touch! Made this soup for the second time today it’s delicious. My husband and I try to go vegan at least twice a week and this is one of our go to meals. Thanks so much, Anne! So glad you enjoy this recipe so much! It’s a favorite of ours, too. Please stay in touch! I’m thinking of making this soup and would like to add garbanzo beans. Would that affect the soup at all (in a bad way)? Hi, KG, Thanks for your question! I think that would be fine. I don’t see how it could hurt. Hope you enjoy! Hi, Anne, Thanks for your question. It can be spicy if you use the full amount of red curry paste called for. The red curry paste is what gives it an amazing flavor. Start with a teaspoon and work your way up. Thanks again and hope it works out for you! I’m in the process of cooking this soup now. My house smells so good, warm and cozy! I can’t wait to taste it! The bonus is this is a one pot dish and clean up is super quick! I’m new to your blog and am super excited to find more recipes. Hi, Tish! Welcome and thank you so much! Hope you enjoyed and please stay in touch! We LOVE making this soup in our house. Can you recommend any side dishes that would go well with it? Hi, Rose, I”m so happy to hear that you love this soup so much! What about my Thai Sweet Chili Green Beans? https://www.fromachefskitchen.com/thai-sweet-chili-green-beans/? Or, a green salad with a balsamic vinaigrette? Thank you and if I think of any other side dishes I’ll reply again. Thank you for this great recipie, I made it today and will be taking it camping. It will be a great meal after a day of hiking. Thanks, Maura! So glad you enjoyed and please stay in touch! This soup is amazing! So flavorful. I haven’t made many soups, but I have to say this is definitely one of the best I’ve ever made. Thanks, Teal! So glad you enjoyed! Soups are one of my favorite things to make. Hope you’ll try some of my others and that you’ll stay in touch! Hi there! This recipe looks so good, but I don’t have a crock pot nor Dutch oven. What else could I use? Sorry, just getting into cooking more. Thanks! Hi, Melissa, Glad you’re getting into cooking! Just use a regular heavy pot–like stainless steel with a thick bottom. If you use a light aluminum pot, things can burn on the bottom. Hope you enjoy! Better than I thought! SUCH a good soup 🙂 I made it in the crockpot and it was perfect! Thanks, Laurel! So glad you enjoyed! This soup is so amazing ! Have been leaning toward a more vegetarian diet so this is perfect for us ! Tysm. Thank you, Enid! Glad you enjoyed and please stay in touch! I made this soup on the weekend and it is so good!! This recipe is a keeper for sure! Thanks, Lisa! Glad you enjoyed! Holy cow, this was so delicious! I have shared it with many!! Am making again today. Thanks! Thank you, Juliet! It’s definitely a keeper. Thanks so much for sharing it and please stay in touch! Thanks so much, Ginger! Omg, a Thai-inspired quinoa and lentil stew sounds SOOOO good. Looking forward to it! Do you use homemade stock or do you have a store bought one you recommend? Thanks for your question, Janet! I do prefer to make my own, but as you know, that’s not always possible. For a commercial vegetable broth I like Pacific. For commercial chicken broth, I like Swanson Natural Goodness or Swanson organic. It’s always better to start out with something low-sodium if purchasing. You can always add salt. Thanks again and hope you enjoy! Hi, Gaylen, Glad you’re enjoying! It’s awesome soup! I don’t provide nutritional analysis because products can vary. Try the SELF nutritional analysis for how you actually make it. Thanks again and please stay in touch! Wow. This soup is delicious. I made it in my instant pot, manual 12 minutes. Will be eating this a lot this winter! Thanks! Thanks so much, Jessica and please stay in touch! Can u cook this in a crockpot and if so how would it need? Hi, Hannah, I definitely think you could do in the slow-cooker. I’d get everything cooked to the point of adding the lentils and sweet potatoes then combine in the slow-cooker. You just need to be careful putting hot things into a cold crockpot. I’ve had an insert crack that way. You shouldn’t need too terribly long–perhaps two hours on high? Four on low? You may not need as much broth because it more or less steams in the slow-cooker. Please let me know how it goes. Thanks so much! Thanks so much, Natalie! Loved cooking with my mom. Glad you enjoyed and please stay in touch! Thanks, Kallie! I appreciate it and please stay in touch! I am eating this right now and am obsessed! I added a little extra curry paste and an extra clove of garlic. It was also a super simple recipe too. I’ve already shared the recipe with a friend. Delicious! Thank you!! Thanks, Amanda! You should absolutely adjust things to your taste. Glad you enjoyed! I’ve made this a couple of times and it’s amazing. I substituted leeks for the onions, since they don’t agree with me. Thank you so much, Ashley, for the feedback and for reading. Glad to know you were able to find a suitable substitute. Please stay in touch! This soup looks so warm and inviting. I wish I had a bowl to warm up with right now! What a gorgeous soup, Carol. I had no idea that red lentils cook faster than other colors. So interesting. Also great to learn about the Maesri curry paste. This is one soup I definitely would love to try.